Polo Villas is located in the historic resort town of La Quinta, a growing city with an enchanting Old Town boasting some of the area's best dining, shopping, and personal services. Over 120 exceptional golf courses, including the famous PGA West are nearby as well as the largest resort in the Coachella Valley - the La Quinta Resort & Spa. The City of La Quinta boasts some of the most majestic and scenic views in the U.S. 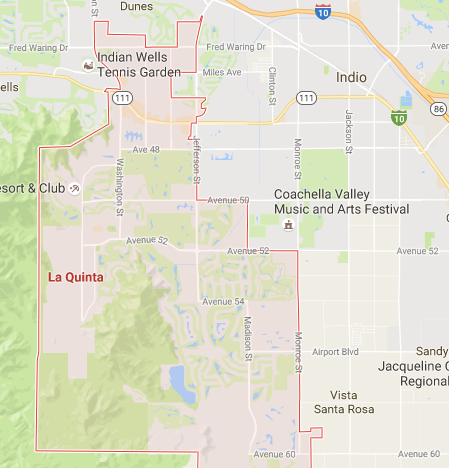 It is simply “the GEM of the Desert.” Today, the City of La Quinta is flourishing. Today the City of La Quinta is booming with a growing population, a large winter/spring seasonal population, affectionately known as “snow birds”; retail stores along Highway 111, Washington Street and charming boutique shops and restaurants in its Old Town Village area; tourism; a variety of recreational opportunities; cultural activities; and our amazing mountain views.